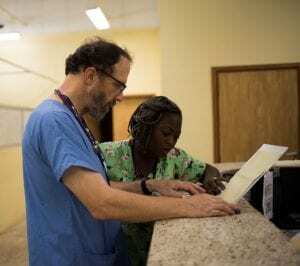 Medical missionary Rick Sacra has been evacuated three times—all from the same place. He’s spent a career at a mission hospital in Liberia, leaving when he’s in physical danger and then returning again and again—after civil war, political unrest, and Ebola epidemics. If you ask why he keeps going back, he’ll laugh and tell you he’s stubborn. “When something happens to the people you love—as hard as it is to be right there with them, it’s even worse to be far away feeling helpless,” fellow missionary and longtime friend Dave Decker said. It’s the emotion you feel when your child gets sick at school, or your sister in another city gets into a car accident. It’s how you felt if you were out of the country when the planes hit the World Trade Center. It’s what made Bonhoeffer return to Germany, what made Gandhi head back to India. It’s like that, but not quite. Because Rick was born near Boston. He went to college in Rhode Island and medical school back in Massachusetts. He married a girl from Florida. If anything, his home was on the East Coast. 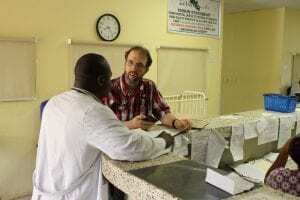 “During the war, when ELWA Hospital had to close temporarily, the Sacras followed the Liberian refugees to Côte d’Ivoire and ministered to them,” said fellow medical missionary Jon Fielder. Fielder’s organization, African Mission Healthcare, awarded Sacra the Gerson L’Chaim Prize for Outstanding Christian Medical Service this past October. Rick grew up in a Congregational church in the Boston suburbs, attending Sunday school and vacation Bible school and youth group. Because he wanted to do both. As a child he checked out library books on the human body, animals, and biologists such as Louis Pasteur and Alexander Fleming. In elementary school, he asked his dad about going to medical school. In eighth grade, getting his appendix out was the highlight of his year. Rick never wavered from his goal—except for a brief moment of panic at Brown University when his professor told him his grades weren’t good enough for medical school. He dropped the rock band, moved to a room next to his “nerdiest friend,” and pulled his grades back up. After college, Rick and his fiancée, Debbie, spent a summer in Japan with Campus Crusade (now Cru) to get the feel of overseas mission work. Both loved it, but they heard that almost everybody loves mission trips for a summer. To get the real experience, they were told, you have to stay for at least a year. So the couple looked for somewhere they could serve for a year. They found a list of mission hospitals in Africa—the continent with the biggest health-care needs—and asked 10 if they could come for a year. “Medical student blocks are eight weeks,” Rick said. Mission hospitals aren’t set up to take students for any longer. ELWA Hospital in Monrovia, Liberia, also said no. The hospital was built in 1964 by SIM missionaries to support the community that had grown up around the first Christian radio station in Africa—call letters ELWA. But the ELWA community also had an elementary school with about 150 kids, and they were looking for a junior-high social-studies teacher. And Debbie was a junior-high social-studies teacher. They found out it was on Africa’s west coast—a country established by ex-American and ex-Caribbean slaves in the early 1820s, where economic development had been slow to develop, and where president Samuel Doe—who had gained control through a coup—kept power by crushing coups. 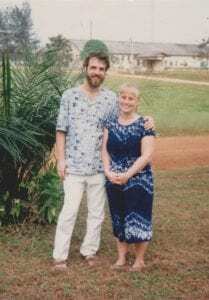 The Sacras spent the 1987–1988 school year in Monrovia, on a compound bustling with close to 70 missionaries—doctors, teachers, boarding-school parents, radio staff—and their families. After the 1987–1988 school year, the Sacras returned to the United States so Rick could finish medical school and residency. Meanwhile, Charles Taylor (not the Canadian philosopher) launched one last coup against Doe. The president was killed in 1990, leaving a power gap Taylor and his rival warlords would fight over for another seven years. The compound they returned to looked very different. After two evacuations of staff by SIM, just a third of the missionaries remained. Buildings had been hit by mortar shells. The print shop was burned into rubble. The radio transmitter was looted. “But there was a lot of optimism in 1995 when we got there,” Rick said. After all, a transitional government was now in power, so there was no need for more fighting. SIM was eager to rebuild. When the fighting erupted in Monrovia in April 1996, most international NGOs pulled their staff out. Liberia’s battles calmed down in August with a treaty that promised elections the next year. The Sacras stayed in the United States long enough for Debbie to give birth to their third son, then hopped a plane back to Africa when he was 4 months old. 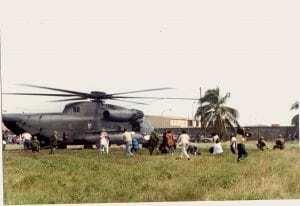 But they couldn’t return directly to Liberia, which was still leaderless and unstable. So they headed to the neighboring Ivory Coast, where thousands of Liberian refugees had fled. 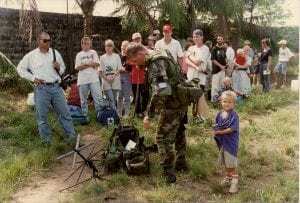 “A couple of us started coming back into Liberia for like 10 to 14 days at a time,” Rick said. He did that for a year—while Taylor was finally voted into power by a country weary of violence, while SIM told ELWA that it couldn’t open up again after three evacuations in six years, while Liberians said they’d reopen the hospital themselves. Then he talked SIM into letting him serve at ELWA Hospital. 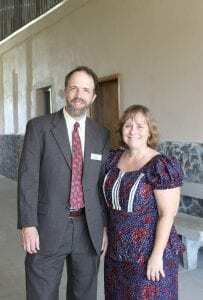 For several years, Sacra shared duties with missionary doctor Steve Befus; when Befus was diagnosed with lymphoma in 2000, Sacra was the only long-term missionary doctor on staff. He brought on a handful of Liberian doctors and discovered he loved to mentor them. And for five years, Liberia was at peace. In 1999, bullets started flying around again, this time in the countryside. By 2003, the rebels reached Monrovia at the same time Taylor was indicted by a United Nations court for war crimes he committed in neighboring Sierra Leone’s brutal civil war. Debbie and the boys left; three weeks later, SIM pulled Rick out too. But the family didn’t leave Africa; they stayed in the Ivory Coast until Taylor resigned. And he did. After the civil conflict ended, the Sacras settled into ministry at ELWA. New mission-team members arrived. Liberia’s lone medical school opened again. “Those were truly the building years,” Debbie told TGC. The Sacras moved back to the United States in 2010 and stayed for a few years, getting their boys settled in high school and college and taking a breather. The need was intense—after 14 years of civil war that killed 270,000, only 16 hospitals remained somewhat operational. Nine of 10 physicians had fled, leaving 90 doctors for a population of a little less than 4 million. The medical training system was in shambles; there had been no residency programs of any kind for 20 years. So Rick balanced between two continents, settling into a pattern of working in Liberia one month out of three. (The low-income clinic where he works while in the United States is flexible with his hours.) He spent May 2014 in Liberia and was scheduled to return in mid-August. That spring, cases of the rare and often fatal Ebola virus were reported in nearby Guinea. ELWA Hospital got an isolation unit ready in April, but the whole time Rick was there, it sat empty. On June 11, the Liberian Ministry of Health sent ELWA its first two Ebola patients. One died in the ambulance. Over the next six weeks, Ebola raced across Monrovia. It spreads through contact with bodily fluids such as blood and vomit; soon, hospitals became the most dangerous places to be. Health-care workers who weren’t infected quit in fear and frustration. One by one, hospitals shut down. “[T]he number of patients grew exponentially,” missionary doctor Kent Brantly told Time magazine. He was working in the unit at ELWA when he and nurse’s aide Nancy Writebol came down with the disease. Days later, another nurse was diagnosed. 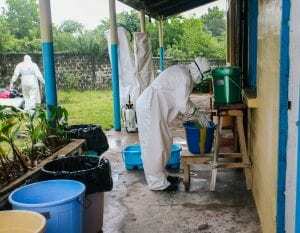 ELWA Hospital closed to decontaminate. But Rick was already booking his ticket. He landed hours before Writebol left and got to work helping medical director Jerry Brown reopen the hospital. Scared of contamination, many staff stayed home. One night the entire hospital crew was Rick and one pharmacy tech. Rick had been in Liberia for four weeks when his temperature began to rise. Right away, he isolated himself. When the tests came back positive for Ebola, he called Debbie. He was not alone—comments sections and social media were full of people saying the same thing. The country was so thunderstruck by health care workers who would sacrifice themselves for Ebola patients that they were eventually named Time’s People of the Year. Neither the criticism nor the praise ruffled Rick. He was flown in an isolation unit to Omaha, and at the end of the first week, was able to talk to Decker a little. On September 25, Rick left the hospital. Ten days later, he developed a fever and a cough, and had to return. His left eye fogged up. His muscles felt like sawdust. At first, he could only do three minutes on a stationary bike. By Thanksgiving, he started to feel itchy for Liberia. By January, he was back in Monrovia. Is it sometimes difficult for the spouse—and the parents and siblings and children and friends—who worry and wait? “The Sacras are not alone in their headlong abandonment of the rational rules of living which modern, well-educated Western professionals are meant to follow,” Fielder wrote. He lists some: Jeff Perry, who stayed in rural South Sudan even after his retina detached, determined to work “with or without vision in my right eye.” Stephen Foster, who kept serving in Angola despite cobras, armed soldiers attempting to kidnap his nurses, and his son’s polio. Russ White, who nearly died of septic shock and then nearly died of a brain infection—but you’ll find him still working in Kenya. In many ways, it’s a family unit even stronger than one that shares a last name. These are spiritual siblings united by their mission to save lives, both physically and also spiritually. He’s not nearly done. With the $500,000 Gerson L’Chaim Prize, he’s planning to train students in family medicine—Liberia still only has one doctor for every 15,000 people. He’s going to install solar capacity so the hospital can have a more affordable source of electricity. And he’s going to create an intensive care unit—crucial in a country that has few resources to treat trauma victims, pregnant women with very high blood pressure, or sick newborns. Among Rick’s friends and family, “I can’t think of a single person who said, ‘Don’t go back,’” Debbie told TGC.